Interlock driveways, walkways and patios are elegant and creates curb appeal, however, when weeds start growing between the stones or pavers start to sink/loosen, it will quickly turn unsightly. This can be avoided by following the simple steps below and it will leave your interlock virtually maintenance free for several years. 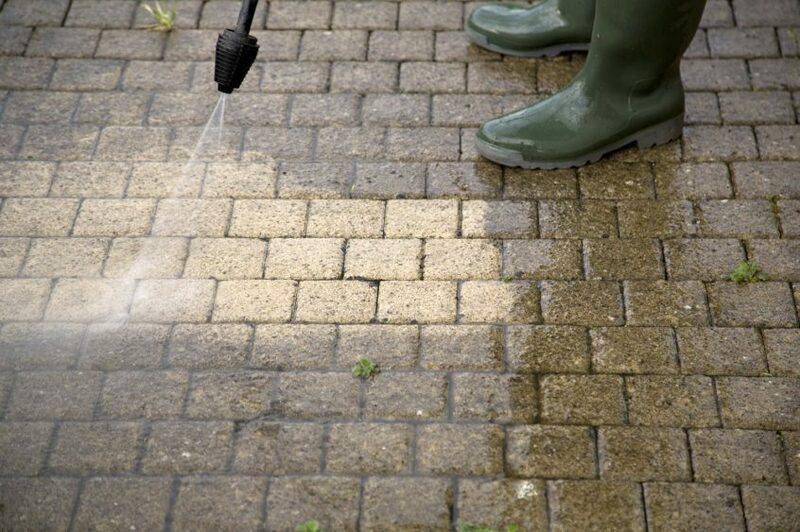 A basic power washer is sufficient to remove all stains and debris. Be sure to clear all unwanted fragments between the joints. This will allow for more space for polymeric sand to fall into which provides stability for the pavers. After cleaning the driveway/walkway/patio, pour polymeric sand onto the pavers and sweep it around with a broom. The sand will fall into the joints filling the gaps. Mist the pavers with water so the polymeric sand can will settle and keep the stones in place. Perform these 3 simple steps once every few years and your interlock driveway, walkway or patio’s curb appeal will be here to stay. Polymeric sand is water activated and is made of a mixture of graded sand and binder. Once activated, it forms a strong yet flexible bond. This prevents erosion caused by wind and rain as well as inhibits weed growth. The larger the spaces between the pavers, the greater the chances for sand to wash away. This 3 step maintenance is usually required once every few years, however, if joints are open with no sand in-between, it will cause the pavers to be unstable. If the pavers settle and water accumulates, it will make it slippery. Therefore, it may be necessary to go through these steps to prevent accidents. Before you begin step 1 (power wash), cover any sensitive areas that might get damaged by the force of the water with a tarp, i.e. garden/plants or windows. If you prefer to have professional landscapers do the work, contact us. At Markstone Landscaping, we can help you with washing and sealing your interlock so you don’t have to. Looking to give your landscape a facelift with interlock pavers but don’t know where to start? Check out our gallery of interlock front entrance and walkway projects to get some ideas.